"A trailblazer in Dallas, Lupe Valdez strives to prove herself on a statewide stage" was first published by The Texas Tribune, a nonprofit, nonpartisan media organization that informs Texans — and engages with them — about public policy, politics, government and statewide issues. But Valdez must master some complicated political footwork as she attempts to replicate her stunning success in local politics and finally catapult her party onto the statewide stage it lost to Republicans decades ago. Texans haven't elected a Democrat to a statewide office since 1994. Following her first-place finish in the March 6 primary, Gov. Greg Abbott quickly began treating Valdez as his general election opponent. But first she must beat Houston businessman Andrew White for their party’s nomination. Early voting in the May 22 runoff starts Monday. Besides, much of the ground-level support she’s already drummed up on a shoestring campaign budget hinges not on the candidate having an intimate knowledge of state government’s infinite intricacies but on Valdez’s own life story, one that many Democrats consider reflective of today’s Texas. Born in San Antonio in 1947, Valdez was the eighth and youngest child of migrant farm workers. On the campaign trail, she frequently recounts how she noticed she was among just a few students who arrived at school with muddy shoes on rainy days. That’s when it dawned on her that most of her classmates, unlike Valdez, lived in neighborhoods that had paved sidewalks. Before stepping down from the sheriff’s position to run for governor last year, Valdez was among a bevy of urban Texas officials who railed against Abbott and lawmakers for the passage of Senate Bill 4. The law allows local law enforcement officers to ask people they detain or arrest about their immigration status. Valdez, like many critics, says it essentially allows police to racially profile Hispanics. At Norma’s Cafe this week, she pointed to a white man in the next booth and said he could be in the country illegally but wouldn’t likely be asked about his immigration status. Meanwhile, people who look like Valdez and are American citizens are more prone to being asked such questions, she said. She said rather than combat illegal immigration, SB 4 will keep Hispanic Texans from reporting crimes or interacting with police. Jolt endorsed White in the primary. Valdez later apologized for her answer. Yet it remains unclear what role Valdez played in federal agents’ placing detainers on inmates. Valdez had more than $57,000 on hand heading into last month’s primary. That was less than White, who had a balance of more than $944,000. But those amounts — even when combined — are dwarfed by the war chest of more than $41 million that Abbott and a specific purpose committee supporting him have. Disclosure: The University of Texas at Arlington and Southern Methodist University have been financial supporters of The Texas Tribune, a nonprofit, nonpartisan news organization that is funded in part by donations from members, foundations and corporate sponsors. Financial supporters play no role in the Tribune's journalism. Find a complete list of them here. A trailblazer in Dallas, Lupe Valdez strives to prove herself on a statewide stage By Brandon Formby May 10, 2018 *Correction appended DALLAS — Lupe Valdez had trouble finishing her sentences Tuesday as she sat in a booth amid the lunchtime bustle at Norma’s Cafe, the home-cooking diner that’s an institution in her Oak Cliff neighborhood. As soon as the former Dallas County sheriff got on a roll about why she should be Texas’ next governor, she’d see someone she knew and walk over to say hi. Or a Dallas police officer would stop by the table. Or a waitress would swing by to mention she really hopes Valdez wins this month’s Democratic primary runoff for the state’s top elected position. Valdez has long been accustomed to such attention. Ever since she narrowly wrestled the sheriff’s post from Republican hands in a GOP-controlled county in 2004, her mere presence in restaurants and dance halls across the city has elicited excited attention from Dallas residents. Still, that’s not what drives Valdez, whose decades-long career in law enforcement and 13 years as sheriff were always about protecting and empowering her fellow residents. “I’m the candidate of the everyday working Texan, and I’m going to be their voice,” she said over a plate of chicken tenders. But Valdez must master some complicated political footwork as she attempts to replicate her stunning success in local politics and finally catapult her party onto the statewide stage it lost to Republicans decades ago. Texans haven't elected a Democrat to a statewide office since 1994. Following her first-place finish in the March 6 primary, Gov. Greg Abbott quickly began treating Valdez as his general election opponent. But first she must beat Houston businessman Andrew White for their party’s nomination. Early voting in the May 22 runoff starts Monday. And what could be Valdez’s most pivotal moment in the quest to take on the state’s Republican establishment comes Friday in Austin, when Valdez and White will participate in their only scheduled debate. “I think Valdez is going to be the candidate against Abbott,” said Cal Jillson, a political science professor at Southern Methodist University. “Although this debate is a dangerous moment for her, I think.” Valdez sometimes struggles to succinctly articulate her stances on issues and details about how she plans to run the second most populous state in the union. That has spurred scathing criticism from her hometown newspaper’s editorial board, left the candidate and her staffers scurrying to reframe controversial public statements and cost her the endorsement of a grass-roots group whose vision for Texas’ future Valdez is trying to champion. But Valdez isn’t nervous about the debate. She isn’t excited, either. She largely brushes off speculation about how her performance Friday will affect the runoff. The game she’s playing isn’t one that turns on 30-second sound bites. “In order for the Democrats to win in Texas, it’s gotta be grassroots,” she said. Besides, much of the ground-level support she’s already drummed up on a shoestring campaign budget hinges not on the candidate having an intimate knowledge of state government’s infinite intricacies but on Valdez’s own life story, one that many Democrats consider reflective of today’s Texas. “She encompasses a multicultural group of people looking up to her, people having their hope in her,” said Marina Vasquez, a Valdez supporter who lives in Austin and has met the candidate at multiple events. From schoolgirl to federal agent Born in San Antonio in 1947, Valdez was the eighth and youngest child of migrant farm workers. On the campaign trail, she frequently recounts how she noticed she was among just a few students who arrived at school with muddy shoes on rainy days. That’s when it dawned on her that most of her classmates, unlike Valdez, lived in neighborhoods that had paved sidewalks. It was a formative realization, one that made her value education and the American ideal of everyone having a chance at upward social mobility. “I am a Democrat because I believe in giving people a fair shot,” she said at a campaign rally in Austin last month that drew about three dozen people who packed into the corner of a burger joint. Valdez got a bachelor’s degree in business administration from Southern Nazarene University and a master’s degree in criminology and criminal justice from the University of Texas at Arlington. She also joined the U.S. Army, earning the rank of captain. After leaving the military, she became a federal agent for U.S. Customs and Border Protection and then the Department of Homeland Security. Valdez focused on fraud and drug cases for decades, often going undercover because she was among the few agents who could speak Spanish. She reveled in the work, which she saw as a way to improve other people’s quality of life. “I loved it because that’s exactly what we’d focus on: getting rid of the people that were harming the community,” she said. 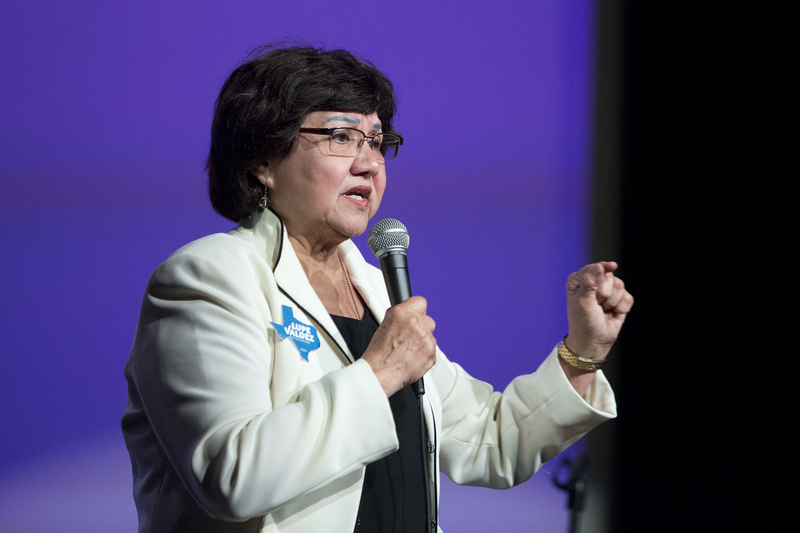 As Valdez neared the required retirement age of 57, she started to think about running for public office. She talked to Dallas County’s Democratic Party officials about throwing her name in the ring for a constable or justice of the peace position. But at the time, the county’s longtime Republican sheriff was embroiled in a scandal about how he awarded a jail commissary contract while he was also facing re-election. A Democratic Party official asked Valdez if she’d thought about running for sheriff. “I said, ‘You know I’m gay,’” she recalls. “He said, ‘Yeah, we’re going to have to work through that one.’” Political stardom and bureaucratic pushback On Nov. 2, 2004, Republican President George W. Bush sailed to re-election, the GOP added a handful of congressional seats to their existing majority, voters banned gay marriage in 11 states and a Hispanic lesbian Democrat was elected Dallas County sheriff. The world was stunned. Overnight, Valdez became a national Democratic star, a symbol of hope for a party that had long lost Texas and was trying to position itself as the champion for a diversifying American electorate. Profiles quickly followed in The New York Times and The Washington Post. The Guardian called Valdez “the unlikely sheriff in Bush’s backyard” whose win was “an upset brought about by local scandal, demographic evolution and personal chutzpah.” The tidal wave of attention surprised Valdez. Her victory did not. Valdez said she “worked like the Dickens” on the campaign trail. She didn’t hide the fact she was gay. But state Rep. Yvonne Davis, D-Dallas, cautioned her to not let that become her identifier. Davis told Valdez to tout her abilities, talent and decades of law enforcement experience. “That was some very smart advice,” Valdez said. And almost immediately, her selling points were put to the test. The Dallas County jail, which the sheriff oversees, failed eight state inspections between 2004 and 2010. The 8,000-square-foot jail racked up violations for an unsafe ventilation system, backed-up plumbing, insufficient staff training and inadequate inmate health care. Then the U.S. Justice Department sued Valdez and the county, alleging that poor mental health care and lackluster medical facilities inside the jail violated inmates’ constitutional rights. Valdez said she inherited the problems from her predecessor, an assertion that longtime Dallas County Commissioner John Wiley Price backs up. County officials spent years renovating the jail, which houses about 6,000 inmates on any given day, and working with state and federal officials to mitigate problems. The jail passed state inspection in 2010. The Justice Department dropped its suit in 2011. “It’s really hard to find anything that Sheriff Valdez did not do to bring this county into compliance and make it a model institution, as far as institutions can go,” Price said. Still, Valdez weathered criticism for taking years to comply with state and federal officials’ expectations. She said one of the biggest roadblocks was changing the culture of the department, a complicated undertaking she said required patience. “Change is necessary, but you can’t do a rapid change or there will be pushback,” she said. Criticism from left and right Before stepping down from the sheriff’s position to run for governor last year, Valdez was among a bevy of urban Texas officials who railed against Abbott and lawmakers for the passage of Senate Bill 4. The law allows local law enforcement officers to ask people they detain or arrest about their immigration status. Valdez, like many critics, says it essentially allows police to racially profile Hispanics. At Norma’s Cafe this week, she pointed to a white man in the next booth and said he could be in the country illegally but wouldn’t likely be asked about his immigration status. Meanwhile, people who look like Valdez and are American citizens are more prone to being asked such questions, she said. She said rather than combat illegal immigration, SB 4 will keep Hispanic Texans from reporting crimes or interacting with police. “It’s a cruel law,” she said. But a Dallas high school student last month accused Valdez of “supporting anti-immigrant policies” that “expanded” Immigration and Customs Enforcement. Around 2007, ICE stationed deportation officers inside the Dallas County jail to regularly check the immigration status of inmates. Those who are suspected of being undocumented immigrants have detainers placed on them so they will not be released without ICE being notified and given the opportunity to begin deportation proceedings. Democratic candidate for governor Lupe Valdez's answer to an immigration question cost her the endorsement of Jolt, a group aiming to turn Texas blue. Marjorie Kamys Cotera for The Texas Tribune The student’s comment came during an event organized by Jolt, a group aiming to mobilize young Latinos to put Texas in Democrats’ hands. Valdez skirted details about ICE’s so-called Criminal Alien Program and said illegal immigration is a “federal issue and there are certain things that we have to do.” Jolt endorsed White in the primary. Valdez later apologized for her answer. Yet it remains unclear what role Valdez played in federal agents’ placing detainers on inmates. An ICE spokesman said the federal agency “coordinated with Dallas County Jail” before stationing agents inside the facility. It is one of five jails in Texas where ICE officers are regularly stationed. But when asked about the matter this week, Valdez said she didn’t know the agents were in the jail “for the longest time.” She said her focus in the early years of her tenure was on fixing problems that endangered the health of inmates. She said after she found out about the program, she consulted with county attorneys about the matter. “They said, ‘Seriously, do you want to throw out a federal agency?’” she said. Meanwhile, Abbott has already started portraying Valdez as being weak on immigration enforcement. Valdez shrugs off the criticism. “I’ve always said if they’re coming at you from both sides, you’re doing the right things,” she said. "A very difficult situation" Valdez stood at the back of Black Star Co-op in Austin last month and gave the crowd of a few dozen an impassioned speech about her childhood and the need to provide all Texans opportunities for economic advancement. She portrayed Abbott as the leader of a state political establishment that drums up fear and ignores constituents’ actual needs. “We’re going to give him a wall of millions of people who will stand up strong against hate,” she said. As Valdez shook hands and posed for pictures, supporters talked about how they’ve witnessed a surge of energy and excitement for Democratic candidates among Texas voters. “I think they are waking up,” said Bonny Krahn, chair of the East Travis County Democrats. “We’ve had lifelong Republicans come over to the Democratic primaries.” But the party still faces massive odds in unseating Abbott — or any other Republican who holds statewide office. Jillson, the SMU political science professor, said the proof is in the campaign coffers. Valdez had more than $57,000 on hand heading into last month’s primary. That was less than White, who had a balance of more than $944,000. But those amounts — even when combined — are dwarfed by the war chest of more than $41 million that Abbott and a specific purpose committee supporting him have. “It’s really a very difficult situation,” Jillson said. “That accurately describes the current state of the Democratic Party in Texas.” Jillson said White’s credentials as a moderate Democrat would likely help him draw more votes from independents and middle-of-the-road Republicans than Valdez would in November. And, he said, Friday’s debate could be the turning point that shifts the race in White’s favor. “She is not a smooth natural speaker,” he said. “Even though she’s been elected sheriff several times, she is not intimately conversant with a lot of state policy issues. So she struggles to articulate her position and conform it to the Texas political climate.” Not that Valdez pays much attention to such assessments. Instead, she’s focused on running the same playbook that launched her party’s eventual takeover of Dallas County politics more than a decade ago. “I reached out to the voters, and that is what makes all the difference in the world,” she said. Disclosure: The University of Texas at Arlington and Southern Methodist University have been financial supporters of The Texas Tribune, a nonprofit, nonpartisan news organization that is funded in part by donations from members, foundations and corporate sponsors. Financial supporters play no role in the Tribune's journalism. Find a complete list of them here. Correction: A previous version of this story included incorrect fundraising numbers for White. Read related Tribune coverage The son of a governor, Andrew White long avoided politics. Then a health crisis, his dad's death and a hurricane changed his mind. Forecasting the Valdez-White debate and understaffed Texas prisons (podcast) Here’s how much Ted Cruz and Beto O'Rourke have raised in their midterm Senate race "You’re not as safe as you should be." How understaffing is affecting one Texas prison "A trailblazer in Dallas, Lupe Valdez strives to prove herself on a statewide stage" was first published at by The Texas Tribune, a nonprofit, nonpartisan media organization that informs Texans — and engages with them — about public policy, politics, government and statewide issues. Link back to the original article, which is located at https://www.texastribune.org/2018/05/10/lupe-valdezs-quest-oppose-gov-greg-abbott-could-hinge-single-debate/.